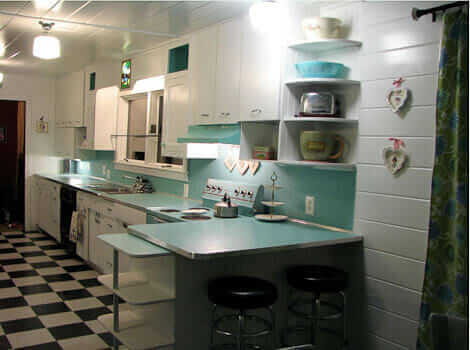 Home » Kitchen Help Category » Readers and Their Kitchens » Create a large, fabulous retro kitchen and breakfast room for less than $6,000 — Carrie did it! 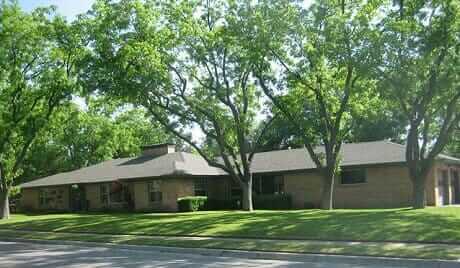 June 2009 We bought a 1980 Tudor that had been sadly neglected and vandalized. There was a yucky sink and a rotted out cabinets in in the kitchen. We replaced the sink base, bought several bookshelves at a garage sale, and found a 1950’s aqua chrome dinette with four chairs. This served as my kitchen for an entire year, which gave me plenty of time to think about what I wanted as I struggled with feeding 12 people in a giant mess. Yes, 12. June 2010 Still unsure what I want to do, I hung up some curtains I made out of some green and blue flower power fabric. I saw a friend’s black and white floor. I sat and drank tea at my chrome dinette. POW! Finally the lightbulb went on and I decided I wanted to go for a Retro look. 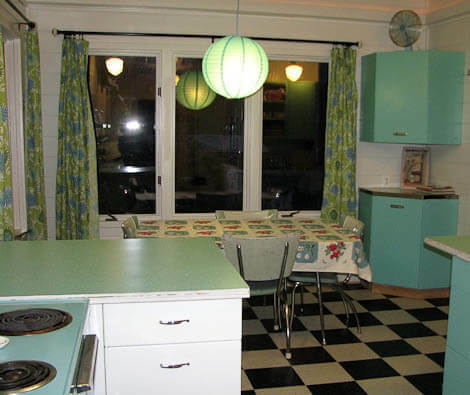 I googled black and white checkered floors, and eventually found Pam’s kitchen in all its aqua glory! I was lost in MCM madness and I don’t think I have missed a single day drinking in all the info on the site. My husband came home to find I had emptied the kitchen, gutted the walls, and started to tear up the old broken tile floor. Surprise! He said “I guess you want to work on the kitchen now…” Ha ha. I must mention that we are seasoned renovators, so this was nothing new. This will be our fifth kitchen project from scratch. 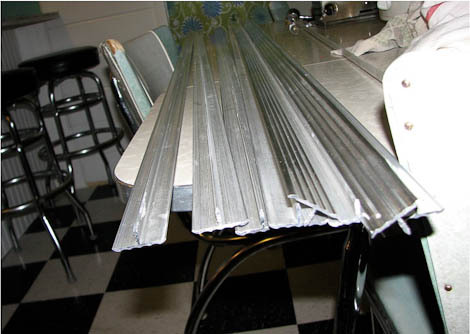 August 2010 Steel kitchens were a new thought to me…I debated whether I could find enough to complete our kitchen. I went to a garage sale…and there was a Youngstown 54″ sink base! I bargained the guy down from $50 to $25 then and there and hauled it off. It then became my “part time job” to search Craigslist. Um, like morning, noon, and night job. I found 5 more Youngstown cabinets in Ohio for $150. I found 15 more mystery brand cabinets that I had to fight for for $300. I then started to spend hours trying to figure out a layout that would work. I mean HOURS AND HOURS. This kept me sane while the kitchen was a mess. Well, sane for me anyway. Progress: My wonderful experienced husband started putting in extra insulation while one of my sons scraped up the old tile. Other older sons have worked alongside their dad for years so everything was DIY. I cooked in the crockpot a lot. I also made coffee in the hall, fried potatoes in the foyer, toast in the dining room, and scrambled eggs in another corner. With previous kitchen remodels I had set up a temporary kitchen somewhere, but there simply was not room to do that here. 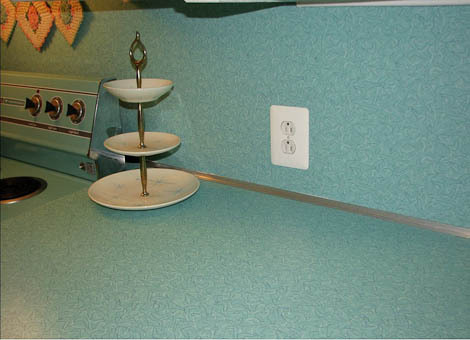 When I started to go crazy, I would go on ebay and search for neat aqua kitchen stuff and Cleminson wall pockets. This kept me focused on what a nice kitchen it would eventually be while we all put up with the mess. The fridge was in the office, the cabinets were everywhere in various stages of being painted, and I was still spending plenty of time on the computer researching and planning. My husband was only working part time, so frugality was very important. So was reuse and recycling. I also found out that everything I was finding was made in the USA, which was quite amazing. The finding everything in the USA also meant driving around a lot to pick it all up. Research: I looked through tons of pictures to help make all those hard decisions…like what kind of walls? I did not want drywall to show. Part of the ceiling was already tongue and groove pine boards, so I opted to put those on the walls in the breakfast area, and use beadboard to cover little spots of drywall. I decided that I wanted the aqua boomerang laminate, and I really wanted it to go on the walls also for easy cleanup. Saw a picture that showed 18 inch laminate backsplash, so that made that decision easy. Did I want a soffit? Did I want to keep the wood cabinets I had and add the steel ones? 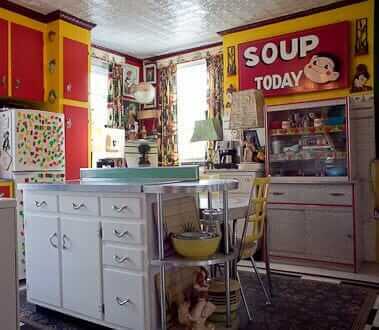 Did I want to go for a total time capsule look, or make the kitchen fit my lifestyle? Where could I hide the microwave? When it all became too much, I went shopping again on ebay and etsy, trying to stay around $10 to $15 for these purchases. I found art deco toasters, pyrex bowls, and lots of melamine dishes. I had a notebook for ideas, pictures, layout ideas, wish list, stuff to find, and decisions to be made. Like where can I put geraniums. Seriously, I spent a lot of time reading on how to set up efficient work zones (like lunch making area, baking area, storage area, cooking area, appliance area, etc.) I went to my local thrift shop a couple times a week and found canisters and cake carriers. People probably thought I was nuts, muttering to myself ” oh look, I bet this is from the late 60’s…oh look, harvest gold!”. I was at church and started explaining to everyone about the birch cabinets, yellow linen countertop, and steel counter edging in the church’s kitchens. They listened politely of course to my retro ravings. September 2010 Decisions, decisions… Floor: I found a box of Armstrong VCT at a garage sale for a $1. My mother in law gives me a half a box. Neither is the color I needed, so I decided to install these cheap tiles under the cabinets where they would never show. I find the classic black and white VCT,and save it for my longsuffering dh and sons to put in later. 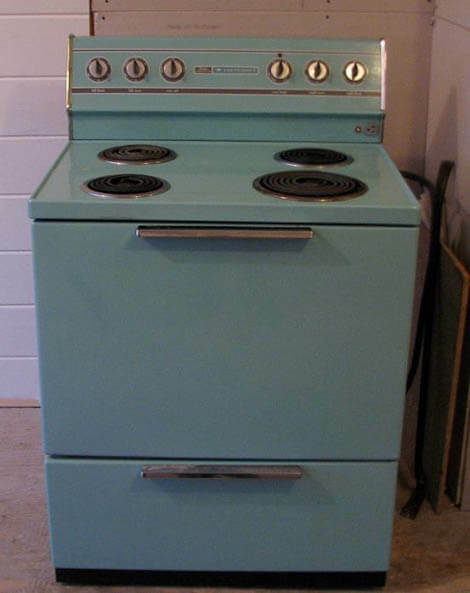 Appliances: I almost die of happiness when I find an aqua Hotpoint stove for $100. Folks at The Old Appliance Club helped me find the correct insulation and my husband, who is a master electrician, rewired the stove. For $280, my lovely stove now works. I wanted white or retro, but settled for a black $49 dishwasher off CL. I decide to buy a $35 range hood and paint it until I can find a new? old? one. Already owned a giant commercial oven I snagged when a local school closed, hey I want to make 12 pizzas in 10 minutes! I searched for a fridge. Finally decided to take my one year old scratch and dent fridge I got for $250 and painted it Holiday Turquoise. Sprayed the handles silver, and added a chrome logo that says “Streetmachine” just for fun! 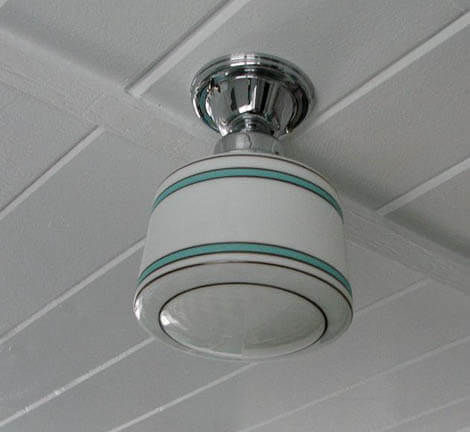 Lighting: Found 4 matching chrome ceiling mount bases on ebay for $20 each. Drooled over the hand painted aqua schoolhouse globes at Schoolhouse Electric. Bought one and decided this was one area that I was going to splurge, even if I had to look at bare bulbs for awhile before I could afford 3 more globes. October 2010 My husband gets a full time job! Yeah, more money but less time to work on the kitchen, the progress slows way down. One of the car’s engine blows, and other car hits a deer. No extra money for the kitchen for awhile…oh well. Cabinets, cont. : I need more cabinets, and my part time job looking for them has not been successful for awhile. I finally find a listing with no pictures on CL. The guy says he has some “old metal cabinets”. He thinks maybe 5 or 6. He wants $100 and he does not want to give me any more information over the phone. I decide it is only an hour plus away, so off I go with my enclosed trailer. Five minutes away from the cabinets, my dh calls frantic that the wind is supposed to reach 70 mph and does not want me to drive and maybe wreck the trailer. I race to the man’s garage, throw money at the guy, throw the cabinets in the trailer, and race out. All I noticed was that they were yellow and the sink base said …GENEVA! YEAH! I am already going for a kitchen that showcases many different brands (um, not really on purpose). I have to leave the trailer at a friend’s house because of the wind, so I don’t even get to look in the trailer. I can’t get back up there for 5 days so I am very impatient… what did I buy? How many? What sizes are they? Finally, I pick up the trailer and discover my $100 got me 8 Geneva cabinets. I am now the owner of 29 cabinets at a mere total cost of $575. Well, plus gas, time, and paint. Back to the layout to rearrange yet again. The particle board cabinets in my kitchen are falling apart after one year of use. I decide to take them out and go for the steel that has lasted 60 plus years, so that decision finally gets made. 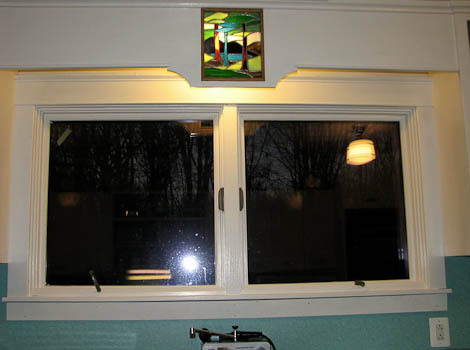 I kept the wood valence and two upper wood cabinets, because I had made a piece of stained glass for the middle and I wanted to leave that there above the sink. 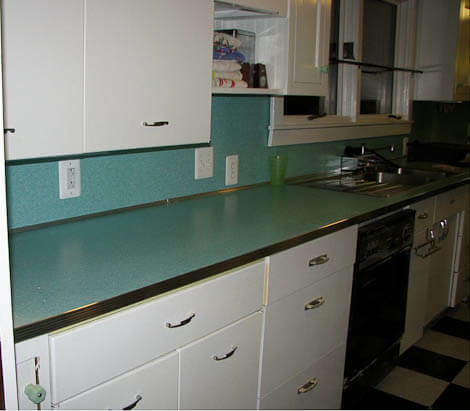 To make the kitchen look as if it had been there for the last 65 years…I decided I was going for the “added to over time” look, so the two upper wood cabinets are getting jadeite knobs ( I am pretending that was in the 40’s). 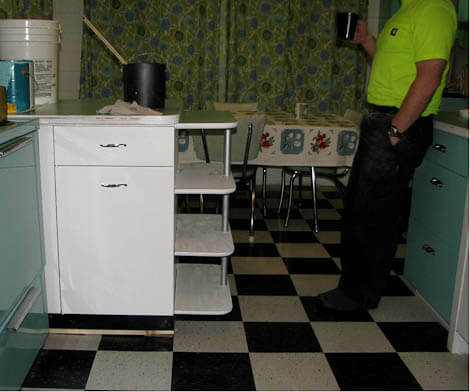 Then I got a steel sink base (it is now the 50’s, at least in my mind…). We of course added more cabinets over time as we got deals (thus the fact I have 5 different kinds). Then the 60’s hit, and I got flower power curtains. 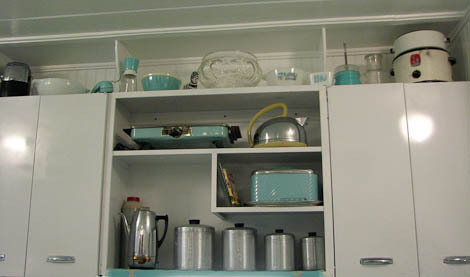 Appliances and knickknacks from all these different time periods to help along my time capsule over 30 years look. Ha, ha, and it only took 8 months to do. 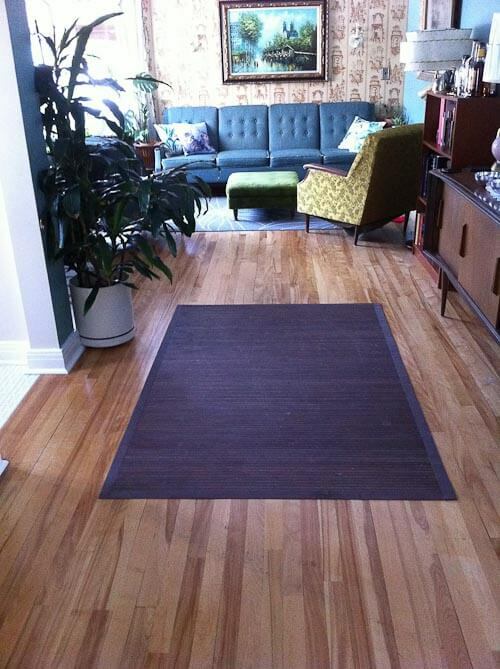 November 2010: It is Thanksgiving, and I am thankful that the floor is finally getting put down. The walls are painted. It actually feels bright and cherry. We take in a Vietnamese foreign exchange student and spend the week making all kinds of Vietnamese food. In the foyer. And the dining room. And the hall. Sigh. I think I need to go shopping again for therapy to make it through this remodel. I find a super cool aqua foil/wax paper/towel dispenser and an atomic 3 tier server. Okay, I can face another day now. 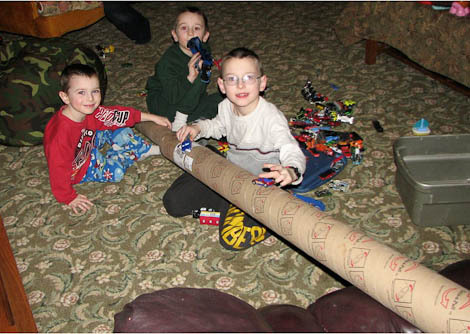 December 2010 I came up with the idea to take two corner uppers and stack them in the breakfast area. DH built a platform to put the lower one one, and installed the other one at regular height above it, so it kind of looks like a corner china cabinet. Dh gets one side of uppers installed, and puts in an open soffit so I can display all these “treasures” from my shopping therapy. A cubby for my industrial stove. A cubby for my fridge. A place to hang my Cleminson wall pockets. Wow, I can stop shopping and start cooking in the kitchen again! January 2011 DH the licensed electrician fixes all my plugs, so I have power. He also puts in the backsplash and the lower cabinets on one side, and my lovely boomerang on the counter. Much debating over the edging, do I want the stainless steel (well, yeah, but budget!) or the much cheaper aluminum “T” edge. Decide on the aluminum. WOW, one side is finished except for trim. Sink: DH says I need to finally make up my mind what I want for the sink and faucet. I like how the single cast iron sink with drainboards look, but I also know that it is easier to break glass on them, as well as a billion tomatoes tend to stain them, and I don’t want to spend the money for a bad condition one OR more money for a nicer one. Decide to go with stainless steel, most of my cabinets are white and I think I need the contrast. Read again all Pam’s posts on sinks. Decide I want an Ikea stainless single bowl with the drainer on one side, it is in my price range of frugal. Make a 5 hour round trip to Ikea to buy sink, because I need it today! Find a $6 Paper lantern chandelier at Ikea. My kids adore it and I figure it is in my budget at that price. Bring that home too and hang above the table. Hey, paper lanterns have been used for centuries so I can’t be too far off. Well, the being far off is probably correct when discussing my mental stability but let’s not go there. 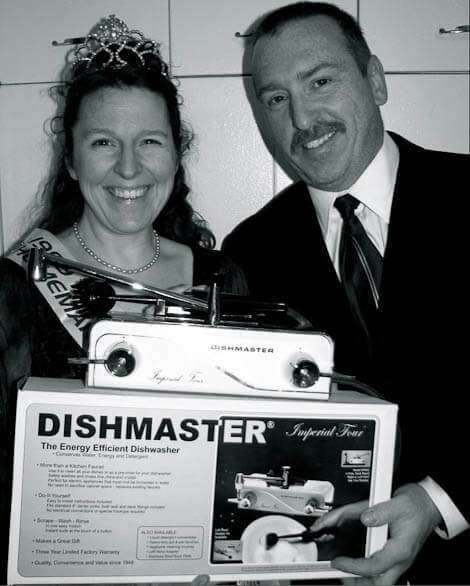 Faucet: Hmm, what’s this Dishmaster thingy? Oh, I want one. Google and find they still make them. I want one right now! I find out a hardware 45 min away has one in stock. Model M-76. Model M-76. My greedy little heart starts plotting when can I get there. DH calls and somehow figures out between the drooling noises on the phone the words “Dishmaster” and “hardware store”. So anyway, he comes home and calls me downstairs really seriously, like something is the matter. He pulls out …a …Dishmaster! I throw a really happy fit and put on my tiara and take a picture just like the one on the blog of me, DH, and my beautiful Dishmaster. I feel like I just won the Retro pageant for crazy people. Cabinets, again: I am short one 30 inch cabinet. ONE! I remember I saw a steel cabinet at a Flint antique store, but they wanted $120 for it. Gulp. I take a chance, go over there, and the dealer has the entire booth at 50% off. I haul that cabinet out of there for $60 so fast that the cashier barely knew she sold it. Then I have to go back of course. I find a 1935 towel drying rack, made right here in MI. Now I can display some of my vintage kitchen towels. I figure out that the cabinet is made by Montgomery Ward. I now have wood, Youngstown, Geneva, Montgomery Ward, and mystery cabinets. I guess I am a showroom. For people that cannot resist the lure of metal and must buy vintage cabinets regardless of brand. Actually, I am mostly proud of the fact that my total is now $635 for 30 cabinets. Um, don’t forget the paint, the gas, the travel time, and all the decisions. I need to stop looking for cabinets for sale, so I give up the part time unpaid CL searches job. I still HAVE to look at the Forum on Retro Renovation every day though, an addict like me can’t just quit cold turkey. Problems: I can’t use the little grey curved shelves I found back in Oct., so DH builds me some curved wood shelves that fit much nicer. I am in agony again because the Montgomery Ward cabinet has the coolest original red top with the steel edging. I really can’t change the whole kitchen to reuse the red top. I guess I will set it aside and decide if can use it somewhere else in the house. I also can’t use the grey crackled ice counter I so carefully saved. I have a layout that includes 27 cabinets, but I can put the extra 3 in my laundry room, so no problem there. I decide I might put all my leftovers on CL when I finish the project. There is no way I have matching hardware, and plus the holes are all different spacings. I decide as long as the hardware is chrome, it is okay with me. Some of the cabinet doors are desperately bad. No problem, I took off the doors and went for an open shelf look. Make a note to find some shelf edging when I have time, ha ha again. Did I mention I am homeschooling 8 kids too? Don’t want to get bored during my kitchen remodel.The kids are growing crystals as an science experiment on the new counter. I find 4 black barstools on CL for $10 each. Guess my breakfast counter is going to be at the same height as the regular counter. Another decision made for me by a CL find. Curtains: Yeah, yeah I know I should have pinch pleated barkcloth but I decide no. I like to redecorate a lot (wow, could you have guessed that?). I decided to make all surfaces that are not easy to change aqua or white. 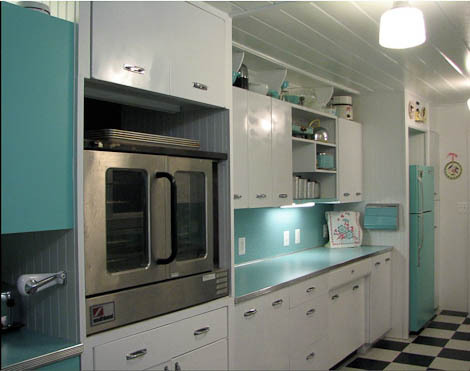 So the cabinets and formica are all aqua or white, with the black and white floor. I had a really hard time deciding if I wanted to go with pink and yellow, or green, or red as accent. If I get bored, I can change the curtains and display items and change the look of the kitchen without a major overhaul. I decided to put in a curtain rod that has the little rings with clips on them. That way, when I have collected enough vintage tablecloths, I can use them as curtains to display them by just clipping onto them without having to sew or ruining the tablecloth. February 2011 Counter edge:Pam has posted about counter edge, and I was planning on waiting a couple months to save up in order to afford the $355 it is going to cost me. Then, another blog reader named dcgrl kindly mentioned a company called McMaster-Carr. I frantically went to their site, and found what I wanted, called them for shipping quote, and ordered immediately! I ordered the aluminum tee edge in a 1 1/4 ribbed edge, they call it push in stem aluminum trim. My problem was my counters were 1 1/4 thick so I needed this size. I needed 8 – 6 ft pieces at $6.48 a piece. For my cove, I choose aluminum 90 degree angle corner in a rounded profile 8 -6 ft pieces. At $2.17 for a 4 foot piece. I realize this is not historically perfect, however, total shipping was about $9 for the entire order. Total price was $78.95. So I paid a 1/4 of what I was expecting. Two days later, the trim arrived, and my wonderful dh installed it! Woo hoo! Everything is done except the baseboard. How much did it cost? Total: $4989 plus labor (ours) over nine months. I figure there were odds and ends that we picked up here and there that added to the cost of the whole project, plus gas money, but even guessing an extra $1,000 for misc. 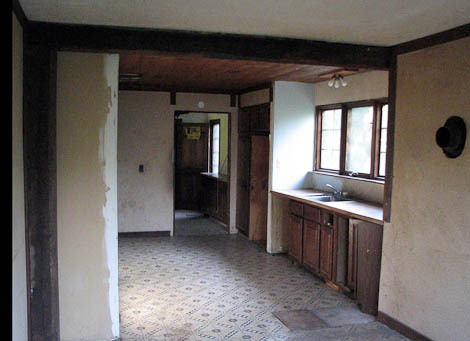 Still puts this remodel under $6,000 for a 12 X 11 breakfast room with 10 X 17 galley kitchen. A great thanks goes out to Pam and this site, for all the helpful ideas. My biggest thanks is to my dh (dearest husband), with the help of our sons he brought this lovely kitchen to life and put up with me changing my mind many, many times! Awesome looking painted cabinets. I know this is an older story but we are embarking on a vintage kitchen remodel and have to paint some old steel cabinets. I saw you said you painted them with Sherwin Williams holiday turquoise in a paint sprayer. 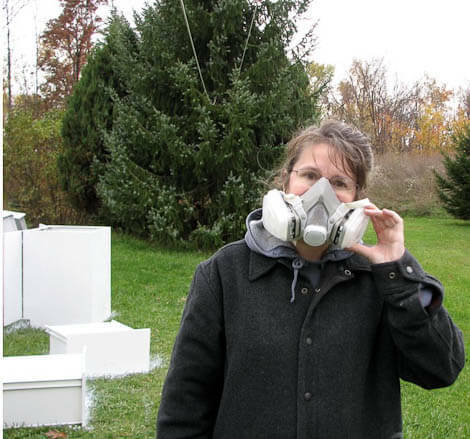 Can you share what kind of paint you put in the sprayer? Did you thin it, clear coat it? And how did it hold up? We are a homeschooling family with 11 kids so I know if your paint job held up for your family it might be able to stand up for ours. Thanks so much for the inspiration. We sprayed the white cabinets with primer and then white enamel. We did not use a sprayer, we used regular spray cans of paint. The Holiday Turquoise was brushed on. I tried a clear coat, but it was terrible looking. 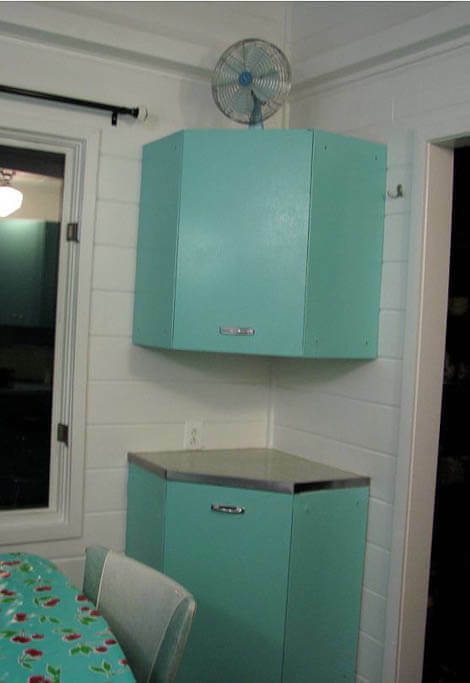 Lately, I sprayed some cabinets at my new house with regular canned spray paint from Lowes, the color was identical to SW turquoise. 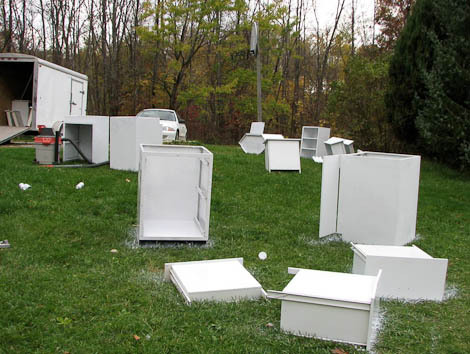 It is more important that you get the cabinets prepared for painting first, they need to be clean and sanded so that you get good adhesion, then let them really dry for a week before you use them or the paint will come off. Hope that helps. I admire your courage and determination to finish this kitchen. Can you tell me the name of the color of Lowe’s canned spray paint that matches SW Holiday Turquoise? I recently bought a set of Youngstowns and would like to paint them. Lisa, also remember: These old cabinets can contain vintage nastiness like lead paint; be sure to consult with properly licensed professionals to be sure to know what you are working with so that you can make informed decisions. Beautiful! 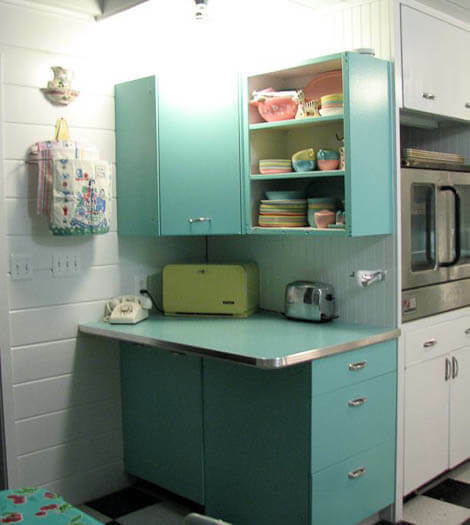 The counter top and the metal edging I have, but STOP with the aqua appliances already! You’re driving me crazy with jealousy! Where does one find such things? I would just die. . .
Craigslist, Ebay, and Etsy is where I did many long searches to find aqua appliances. This is just breathtaking in regard to ingenuity, hard work, and overall beauty. They say the kitchen is the heart of a home (whoever “they” are) and I certainly would love to spend hours in that one! Woww with two Ws!